How to use the Slides (PDF) upload feature? 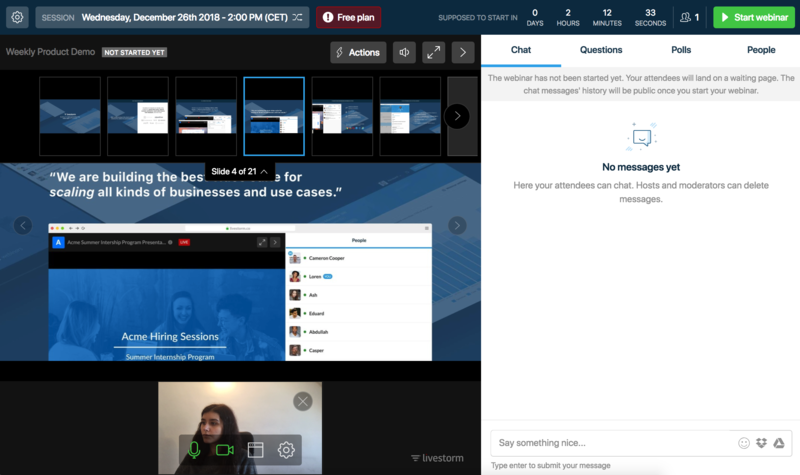 Instead of using screen sharing, you can directly upload your slides inside your webinar room. 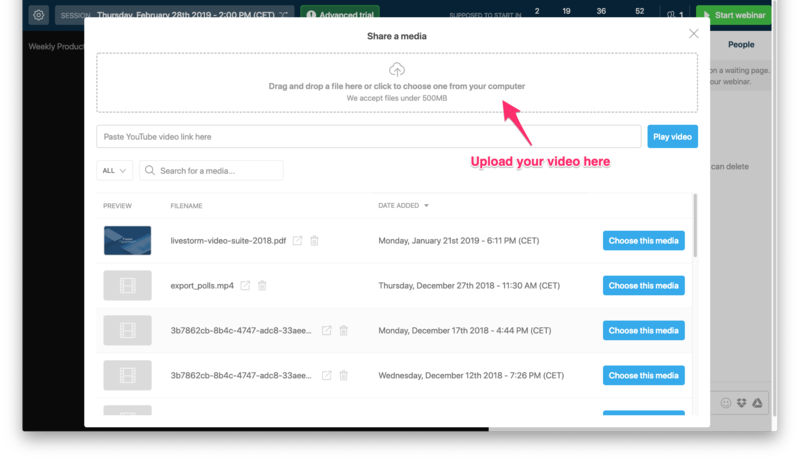 Click on the "Upload Media" button on top and add a new file or select an existing one. 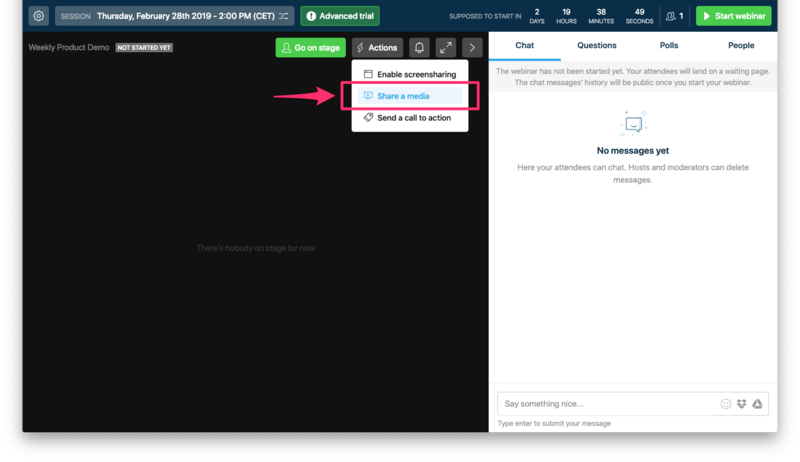 ⚠️ Remember: to have your presentation recorded in the webinar replay, you must share your screen. The media upload feature will not include the slides in the recording at the moment. Click here to learn how to include your presentation in your replay. 📚 Tip: Follow these tutorials to learn how to export your presentation in PDF from Keynote and from Powerpoint . If you add a new presentation: make sure you upload it before you start the webinar, the upload and processing time can take a little while depending on the size of the presentation. With this feature, you can present slides without having to screen share another screen and struggle with your extra monitors. Also, presentations must be in the PDF format, meaning you won't keep your powerpoint transitions. Don't try to upload PPT or KEY files. Here's how to export in PDF from Keynote and from Powerpoint . Who can manage the presentation? The host and the person who has uploaded the media. Moderators can also pass the slides. If you get off the stage, the presentation will remain on stage. If you want to remove it, click on the cross in the top-right corner. 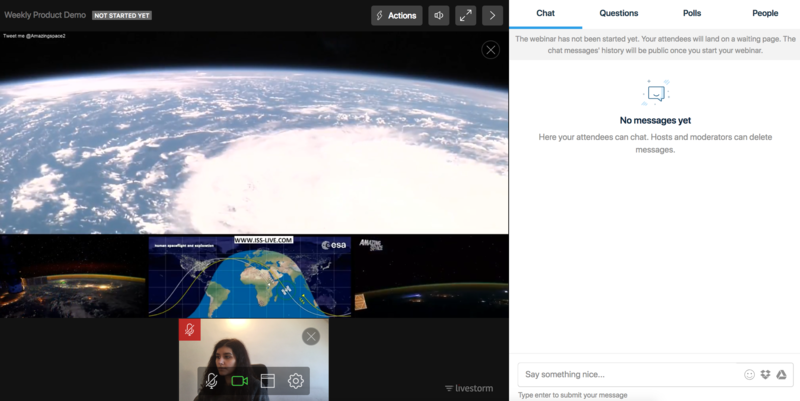 All the attendees in the webinar room except the host and the moderators. They can click on the download icon in top-right corner. Is the presentation available inside the replay? Not at the moment but this is something we're working on. Yes, IE / Safari users will get the presentation as well. The presentation is also available on mobile and on every OS. 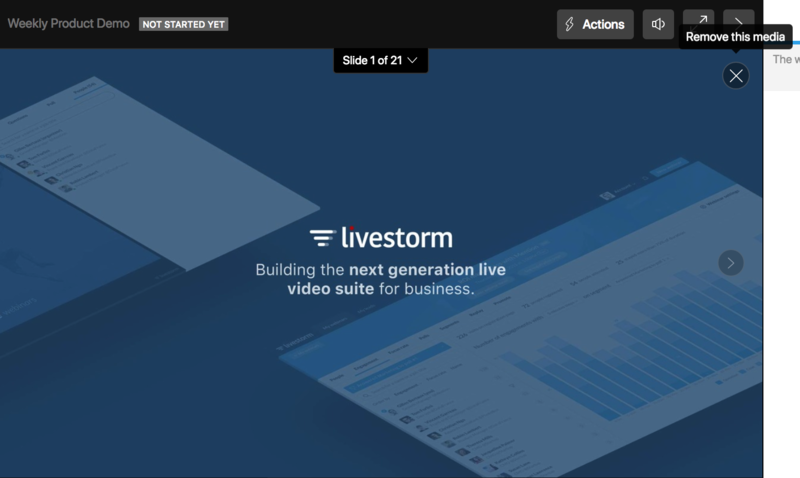 How to add a pre-recorded video to the webinar? Adding a pre-recorded video can dramatically increase your engagement with richer content. Popular use cases are pre-recorded demo, customer-interviews, tutorials etc. Click on the "Share a media" button on top of the room and add a new file or select an existing one. If you add a new video: make sure you upload it before you start the webinar, the upload and processing time can take a little while depending on the size of the video. ⚠️ Remember: The shared videos won't be in the classic replay. However, we have a new replay in beta which will record your videos as well. Let us know and we'll activate it for your account. If you're the one sharing the video and you get off the stage or disconnect, the video will be removed from stage. You can also click on the cross at the top-right corner of it to remove it from stage. Make sure your videos are in the MP4 format. Don't try to upload WAV, MKV or MOV. You can use a software like Movavi to convert your video file to mp4. What's the max size of the mp4 I can upload? You can upload MP4 files with a size of up to 500MB. Make sure that your file isn't too heavy or your audience won't be able to stream it if they have a low bandwidth. If you have a larger file, we recommend to share a YouTube video instead. You could also optimize your file size with a software like Movavi. Are videos synchronized when I click pause or if I go forward in the video? Yes, everything synchronized across attendees. Yes, IE / Safari users will get the video as well. The video is also available on mobile, however, iOS, for example, does not support having two videos playing at the same time. Meaning people on iOS won't be able to watch simultaneously your live stream AND the video you uploaded. Is the video available inside the replay? What about a YouTube Video? Yes, paste a link to whatever YouTube video. The same constraints as the uploaded videos will apply (except for the format obviously).